Note: This branch has closed and moved to Dempsey. So as you can see, dear readers, I know nothing about Spanish food or England grammar. BUT DON’T QUESTION MY AUTHORITY. I have a food blog. If you want to know about Spanish food, go to wikipedia lah. I ordered the Sangria (white wine, $13.50 a glass) first and I LOVE IT. I can’t drink much and dislike the acridity of alcohol but I have always loved sangria. This one has almost no alcohol taste, very fruity and refreshing and light, with a hint of cinnamon. Order some for your 3-month-old baby. Most patrons, I saw, were however drinking the red wine Sangria. I always thought red wine would be heavier and not so suited for sangria but perhaps I would try that next time. Must try everything once mah. Sangra: MUST ORDER. The menu writes: “Please note that we do it the REAL way and these items take at least 25-35 minutes to cook.” Wow, I didn’t know “doing it” and “cooking” have connection worh. No wonder Jamie Oliver is the Naked Chef, more convenient. “Hey you need some mayo? wait a while..moan moan, enough?” And got FAKE way to “do it” meh? Girls, “do it the REAL way,” don’t fake it. There are three different sizes for the mains: small, medium and large. Although for the bigger the better, the waiter recommended that the small portion could serve two people and because we three are anorexic, we ordered two small mains to share: Paella Valenciana ($30) and Fideua de Carne ($30). Waiter fail. His attitude was brusque and supercilious, as if he thought he knew a lot. I dislike his attitude. Since we’re talking about the service, the service is quite bad, under-staffed, not attentive to the needs of the patrons. Very difficult to get their attention. And the server’s explanation isn’t quite correct. “Al dente” means that the food is cooked to be firmed not hard. Eh…but I thought all food should be like that? If it’s hard, it means it’s overcooked! After I ate it, I said, “this is obviously bee-hoon goreng with lap cheong (chinese sausage).” It tasted a little like Hongkong noodles at cze char stalls. Some parts of the “pasta” were uneven, some tasted spicy, some with a burnt charred taste… and I like it. I like the layered texture and every bite was a surprise. (I love surprises!) The meat was marinated very tastily. And I like charred food. But the “pasta” was soggy and the portion was tiny, just a thin film of food on the shallow pan. Not a perfect dish, but if you’re not too picky, it will do. 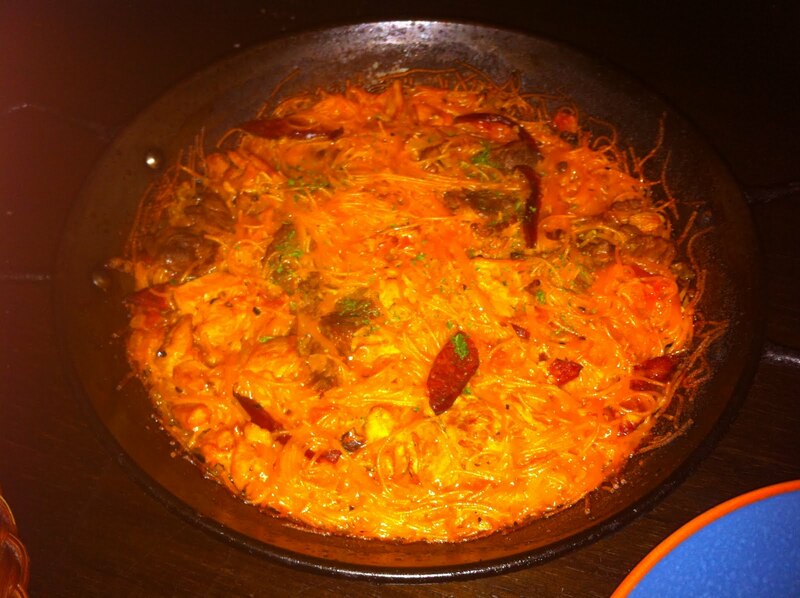 Paella Valenciana: or seafood, chicken and rice in saffron stock. The seafood consisted of mussels, squid, prawns and clams. When I tasted it, I said, “Mui fan.” My friend said I was hard to please. But in truth, I didn’t mind this too. The rice had the taste of the seafood, and the seafood was generous, but not cooked very well, too hard. Hard things are usually good but not in this case. I was still hungry after these! The portions were really quite small so we ordered a small Don Quijote Special ($48). I regretted this; I felt cheated. It is 60% more expensive than the seafood rice we had but it had exactly the same ingredients. The only “special” was it came with big prawns, which weren’t fresh, and had no taste at all. The rice was also less fragrant. FAIL. At a point, my sister asked, “So what is the difference between this restaurant and Fish & Co?” I honestly don’t know. When we got the bill, I was shocked because it came to $44 per person. That’s a lot for cze char food and bad service. I see that the restaurant has great potential and if it just perfected the food, put in some effort, it could have been great. I don’t feel the heart in the food. 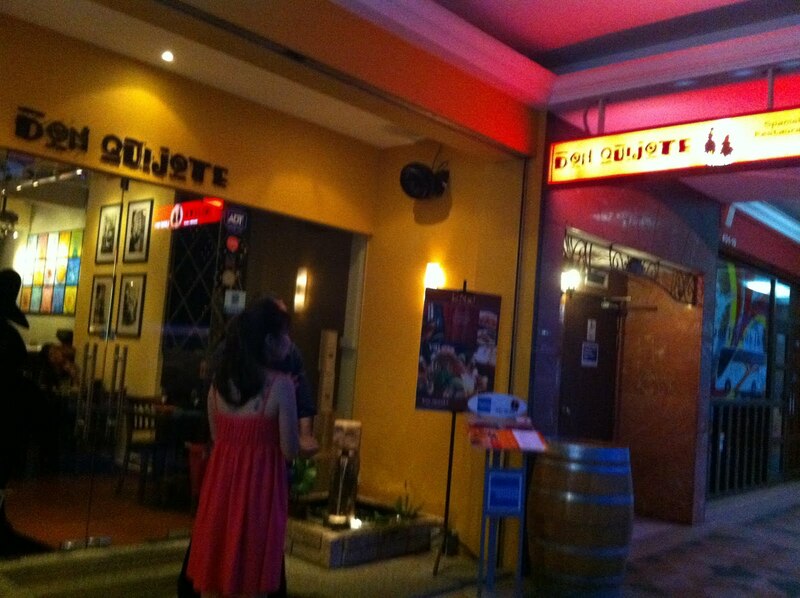 ps: Don Quijote, not Don Quixote meh? I study English lit one ok?